Saturday, April 16, 2011, is a day we won’t soon forget around here. A violent storm system spent the week marching across the U.S., leaving death and destruction in its wake, and saving the worst of its wrath for North Carolina. Lives were lost and homes and businesses were destroyed. While it was a very frightening experience huddling in the closet with my family, all of us were all safe and we didn’t personally suffer property damage. 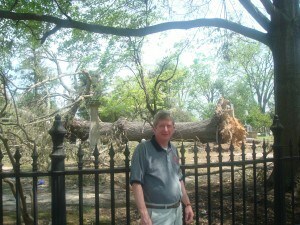 However, all of our neighbors in Downtown Raleigh were not as fortunate, as Downtown suffered a lot of destruction. 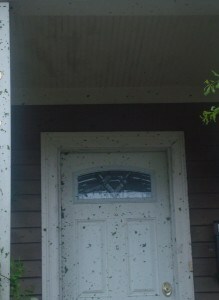 Bit of leaves were stuck to everything in Downtown Raleigh near where the tornado hit. There were trees on top of houses, power poles laying across roads, crumbled chimneys, the tops of trees sheared off, asphalt and sidewalks raised up where trees were uprooted. Main arteries in and out of Downtown were completely blocked by trees and downed power lines. 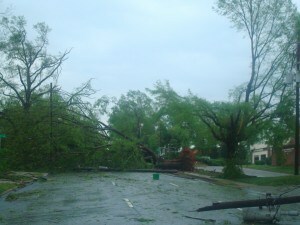 The damage to Shaw University’s campus in Downtown Raleigh was so extensive that the rest of the spring semester had to be cancelled. 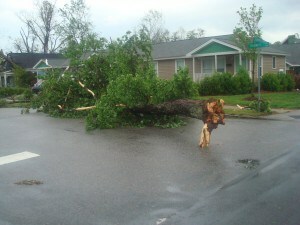 New Bern Avenue in Downtown Raleigh after the tornado. 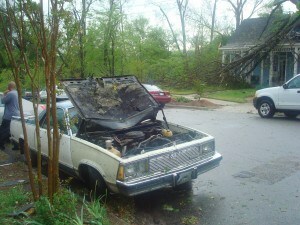 The hood of this car was peeled back by the Raleigh tornado. On the ground in front of the minivan you can see where a tree had been growing. 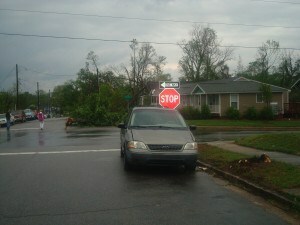 The tree flew over the minivan and landed here in the next block. You can see the tree just to the right of the person in the photograph above. 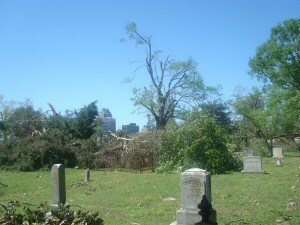 The path of the tornado went right through Raleigh City Cemetery. Tornado damage in Raleigh City Cemetery. After the storm ended, Downtown Raleigh residents left the safety of closets, bathtubs, and hallways and ventured outside. Neighbors were checking on neighbors and lending a hand before the rain even stopped coming down. Those who regained power quickly offered hot showers, cell phone charging, and freezer space to those who had to wait longer for power to be restored. Community cleanup efforts have been ongoing. Progress Energy seemed to put forth huge efforts to restore the power as quickly as possible. And the City of Raleigh has been doing a fantastic job of management in the wake of this emergency, from organizing volunteer efforts to planning for debris removal.